As we can see right here in Hawke’s Bay, the use of robotics is growing rapidly. Older mechanical and conveyor belt assembly lines are being replaced with computer-programmed systems that can pick and choose, lift and position … without health and safety, overtime or holiday pay issues. While robots and automation will increasingly replace people in low-paid, low-skilled, repetitive jobs, this evolution is unlikely to lead to rioting in the street, Depression era welfare lines and societal meltdown, as imagined by some. So, gloom or opportunity? Amidst the growing pile of studies warning government and industry of the inevitable escalation of automation, there’s a distinction to be made between hyperbole and preparing for practical possibilities. In the novelty corner are shapely ‘robo-companions’, teacher’s aids and lifelike humanoid prototypes – including Sophia, who announced her Saudi Arabian citizenship while answering basic questions at an October tech show. And Erica, who took over the anchor desk of a Japanese TV station in April. Two- or four-legged industrial warehouse robots are no longer the clumsy, curiosities of even a decade ago; they’re increasingly agile, able to lift, stack, self-correct and move faster than most humans. Today’s production line reality is a sophisticated one-armed robot delivering accuracy, speed, quality and increased productivity in repetitive tasks that humans won’t do or are ill-equipped for. That’s already evident in many Hawke’s Bay factories, including meat processing, engineering and manufacturing, and production lines at Watties-Kraft, Turners & Growers and fruit and vege packhouses. During a BayBuzz tour of CR Automation’s Hastings factory, boss Peter Richards introduced us to Rambo, a rapid-fire producer of wooden pallets. As the local export economy grows, pallets are in huge demand across a range of industries, but there’s been a problem finding enough people for quality assembly. 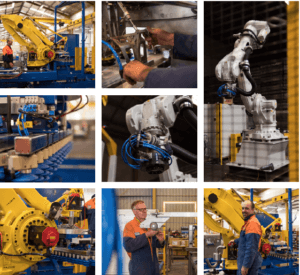 Rambo, a joint production with Tumu Timbers, focuses on automated pallet building, reducing repetitive tasks and potentially trebling the output, although someone still needs to replace the nails in the guns and feed timber into the system. Rambo, with its interchangeable tools, is the first of its kind in New Zealand with clear export opportunities beyond pallet making. It/he was a year in development and six months in prototype before delivery earlier this year. A project like this integrates 3D design, mechanical, electronic and software components. 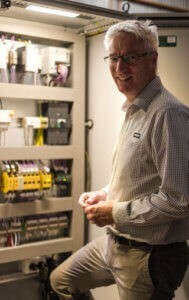 Where possible, CR Automation likes to collaborate with other Hawke’s Bay engineering, electrical and manufacturing businesses to keep it local. Hamish Whyte, managing director of Furnware, describes the four welding robots at his factory “like a family…all four of them going crazy. They do an impeccable job”. Furnware will add another two robots this year and could double its ‘family’ within three years. Whyte says we need to re-interpret technology and how it can bring value to achieve export volumes. Furnware produces ergonomic chairs, soft furnishings, tables, desks, lockers and screen dividers for schools and offices around the world. Once set up, a robotics system can be replicated to add more volume without losing staff; “you still need good people to make sure the robots thrive”. Such continual innovation has enabled Furnware to retain all its manufacturing in Hawke’s Bay rather than offshoring as many businesses did over the past 30 years. The challenge for manufacturing businesses, says Whyte, is to look at systems and processes and decide whether to put the final touches to imported components or drive your own work by being robotic. Hastings-based Haden & Custance started in robotics over 20 years ago and now designs, builds and installs automated de-boxing, de-bagging and defect and foreign object detection systems for bulk processing. It buys in robot arms from Japan or Europe to produce systems for dairy, meat and fruit processing plants around the world that can sell for millions of dollars. Once Haden & Custance carved out an early niche in robotic ‘cheese de-packaging’, it took a punt on the US, and after a slow start that’s now a growth area. The 3D vision-guided system identifies boxes on pallets, lifts 20kg blocks of cheese and removes the cardboard and shrink wrapping at the rate of one every four seconds, ahead of further processing. “Asking someone to lift a 20kg block 400 times a day is asking for trouble. I don’t think you can legally do that now,” says sales VP Nathan King. While outsourcing most welding, laser cutting, machining and fabrication, the company employs mechanical and electrical engineers, automation designers, software coders and those who assemble and test the final product at its warehouse. Better vision guidance is a key to greater variability in robot productivity. “We have to build robust systems that can identify how a product looks, how it needs to behave, and whether it needs rejecting,” says automation manager, Andrew Fowler. “…anyone innovative in agriculture and horticulture will be in demand from international companies”. Once industries are using automated systems, the ultimate ‘vision’ is ‘Lights-out 365’ continuous production without human intervention. Fowler says the objective is ‘truck to warehouse and warehouse to truck’, with automated guided vehicles (AGVs) including forklifts, handling input and output. Haden & Custance wants to prepare customers and packaging systems for this advent and while it’s not a reality yet, some of its offshore clients are pretty close. Fowler points to the growing number of fully automated plants in Hawke’s Bay’s fruit industry, claiming the primary sector is “still suffering from highly manual processes and could benefit from a lot more automation”. Many industries use automation to consolidate in one place. For those that can’t get the staff but need to deliver more product it might be the only way to go, even for smaller scale operators such as fabricators and “those churning things out”. Compac Sorting Equipment kicked off in Te Puke in 1984 based on an innovative kiwifruit sorting and grading machine, invented by founder Hamish Kennedy; then further developed to detect colour, density, size, shape, weight and internal and external quality. Compac’s fresh produce systems – a combination of mechanical, electrical and optical technologies – are in 40 countries with the stated goal being to reduce the labour required for sorting while increasing consistency and accuracy. In 2008 Compac took a 50% share in local packhouse innovator Hastings Fruit Handling Systems with full control gained by 2014 – the same year it began transforming the processes of Hawke’s Bay’s Mr Apple, the largest apple exporter in the country. Mr Apple, which runs 53 orchards across 1,000 hectares of regional land, invested millions of dollars in Compac’s Spectrim automatic defect grader to reduce the human component in its packhouse. The quality control system photographs each apple 240 times a second, minimising handling, reducing cost and improving export grading and consistency. In July 2016, only three months before it was acquired by Norway’s Tomra Systems for $70 million, Compac closed its Hastings manufacturing operation with the loss of “dozens of jobs”. 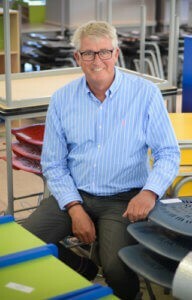 Former Fruit Handling Systems boss Craig Petersen says he grew the company from $600,000 export market to around $15 million before the new owners shut it down. The upside was that another local packhouse innovator, CR Automation, acquired Petersen and many of his skilled staff to accelerate its own presence in mechatronics (robotics, mechanical and electrical infrastructure) and industrial automation. Managing director, Peter Richards, says investment in agritech is at a premium because of population growth and the demand for food … “anyone innovative in agriculture and horticulture will be in demand from international companies”. The day of our interview Tomra acquired Hamilton-based BBC Technologies, producer of sorting and packing machines for small fruits including blueberries, for $66.9 million. CR Automation warns the only way forward, other than bringing a lot more workers from offshore, is to work smarter with greater automation. Within the next five years Richards foresees a timely convergence of market readiness, growing export demands for local produce and affordable technology, including robotics. He says many orchard owners are already planting their trees closer together and training them to fruit higher off the ground in preparation for automatic picking. 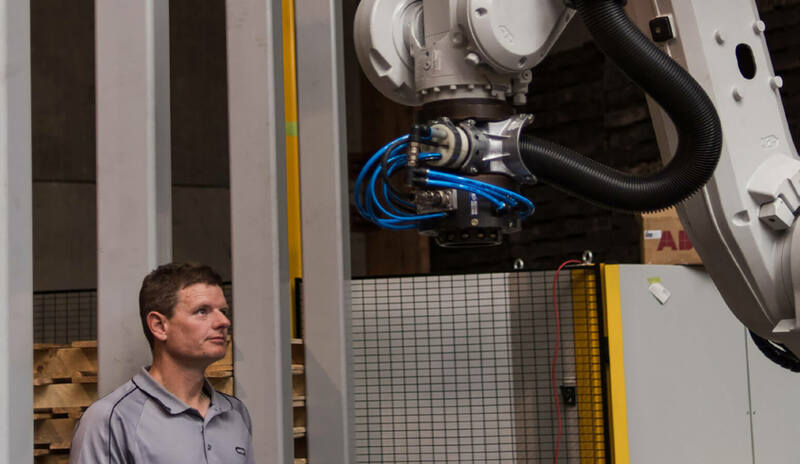 One of CR Automation’s first major robotics projects was a joint venture robot for Heinz-Kraft with neighbouring firm DSK Engineering, which it won against stiff international competition. The robot mixes and matches 30 different products on a 150 metre conveyor system – sorting, scanning barcodes and magnetically placing cans on pallets across three production lines, then shrink wrapping them and printing and applying labels. More recently it replaced two older robots processing pet food pouches with two smaller ones that are more flexible and can be re-programmed for other tasks. Another unit that produced plastic pottles has recently been modified to handle seasonal cans. CR Automation has tripled in size since it acquired around 15 people from Compac. Staff numbers can be as high as 30, with specialised visual systems and high-end engineering contractors bought in as needed. The company could service large orders for existing robots, but is in a strategic planning phase, conscious of other developments on the drawing board and opportunities for expansion in Asia and North America. Richards says the world is watching our innovation culture as we continually aspire to do things better, particularly in dairy and horticulture. And while pioneering local tech innovators continue to build on their proven records, there’s an implicit challenge for other producers and manufacturers to consider what it might mean if they don’t rethink their processes … and get left behind. Pressure from government and industry to ramp up export output delivers a dilemma for industries that need to deliver more product quicker at consistent quality – automation or jobs … and whether you can have one without the other? One core challenge is meeting the aspirations of the Matariki Hawke’s Bay Regional Development Strategy to grow the local economy and employ 5,000 more people, 1,000 of them culled from the region’s unemployed. While that sounds like a good idea in theory, seasonal businesses have historical difficulty finding enough locals and Recognised Seasonal Employer (RSE) people to fill existing vacancies to pick, prepare, pack and prune. And there’s some uncertainty around aspects of the RSE scheme, which brings in around 4,000 overseas workers annually to pick Hawke’s Bay fruit and grapes. CR Automation’s Craig Petersen says there are serious conversations going on across the fruit and vegetable sector, with packers, big players like Turners & Growers, and especially the apple industry, wondering about the part automation will play in the future. “They’re all scared there’s not going to be enough people for what they want to do,” says Petersen. Working with the changing environment required by the emerging robotics and automation revolution will require planning and a lot of cross-industry research and development over the next two years, says Petersen. For example, there’s a plan to increase gold kiwifruit production 50% by 2020, including local crops, with one solution for the labour shortage being the kiwifruit harvesting robots now in the final testing stages at Waikato University. While there may be some comfort in claims in a PWC 2018 global report that New Zealand is “among the most prepared countries for the coming waves of automation” because a high percentage of its workforce won’t easily be replaced by robots, there is no room for complacency. The report, Will robots really steal our jobs?, rates New Zealand as having the sixth-lowest share of jobs at high risk of automation out of 29 countries. Job losses are likely to be the low single digits from the early 2020s, then rise rapidly by the mid- 2030s to around 24%. PWC says job replacement comes in three waves: simple computational tasks and analysis of structured data in the financial services sector; interaction with technology for clerical support and decision making, including moving objects in warehouses; and automation of physical labour, manual dexterity and problem solving in areas such as transport and construction. Andy Symons, PWC’s New Zealand innovation partner, says there’s an opportunity for businesses and government to develop strategies around retraining workers and building an education system “that allows us to replace jobs lost through automation”. Furnware’s Hamish Whyte says intelligent people are needed to run robots to ensure they thrive, but even then, it’s getting harder to find those people. In theory, Whyte says he could keep adding staff to scale up for international demand, but that wouldn’t make good business sense. While robots are becoming more affordable all the time, they still have to earn their living. “There’s no point in having a robot that works only one hour a day … it needs to be working 20 hours a day.” And, as he says, robots are hungry. That’s a point noted by the largest brewer in the area, another major user of robots, who told BayBuzz he needs to grow staff to fill what is becoming three human shifts a day to ‘feed’ the machines! “Our use of robots will increase jobs,” he said. CR Automation CEO Peter Richards doesn’t believe jobs are being lost through technology and if they are, others are being created at the higher end and there’s always retraining. One of the realities, though, is that automation has already sped up conveyor-based processes to the point that no human can manually keep pace with stringent sorting and quality control requirements. The push to produce requires quantity, quality, speed and ways to add value in order to thrive. When that’s tempered by stringent health and safety regulations, difficulty finding staff and an escalating minimum wage, the business case for robotics and increased automation starts to look like a business no-brainer.